Repair or Replace? If that’s the question you need an answer to, let us take a look and give you a free estimate. We’re experts at making carpet repairs but if replacing is a better solution, we’ll tell you. We can repair burns, holes, tears, wrinkles, pulled fibers, fraying, ripples, wrinkles, de-lamination, open or weak seams, loose stairs, bubbles, sprouting tufts, pulled rows, and more. You no longer have to put up with unsightly, unsafe, damaged carpets! 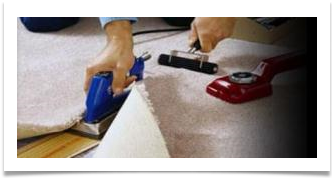 After a period of time, depending on soiling, traffic and installation, carpet can get loose or damaged. 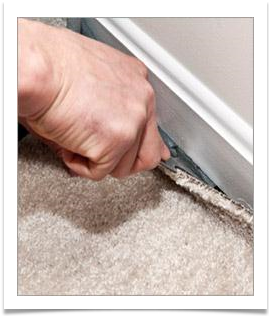 We use a power stretcher to get your carpet as tight as or tighter than when it was new. This will remove all the buckles and ripples in your carpeting. And best of all, since a loose carpet wears faster than a properly stretched one, repair and re-stretching can add years of life to your carpet. This is an issue we can easily fix as well. In many cases, we can take your old, split seam and make it look as if there isn’t a seam there at all. And all of this can be done at a fraction of what it may cost to replace your carpet. Burns, split seams, pet damage, holes, tears or other types of damages can also be repaired using expert repair techniques. From a small cigarette burn to re-stretching your entire home, 1st Dry Carpet Cleaning Services can get the job done for you. Call us now or Schedule Online for a free inspection and estimate. We’ll be honest and upfront about what we can be done to repair your carpet and get it looking like new again.